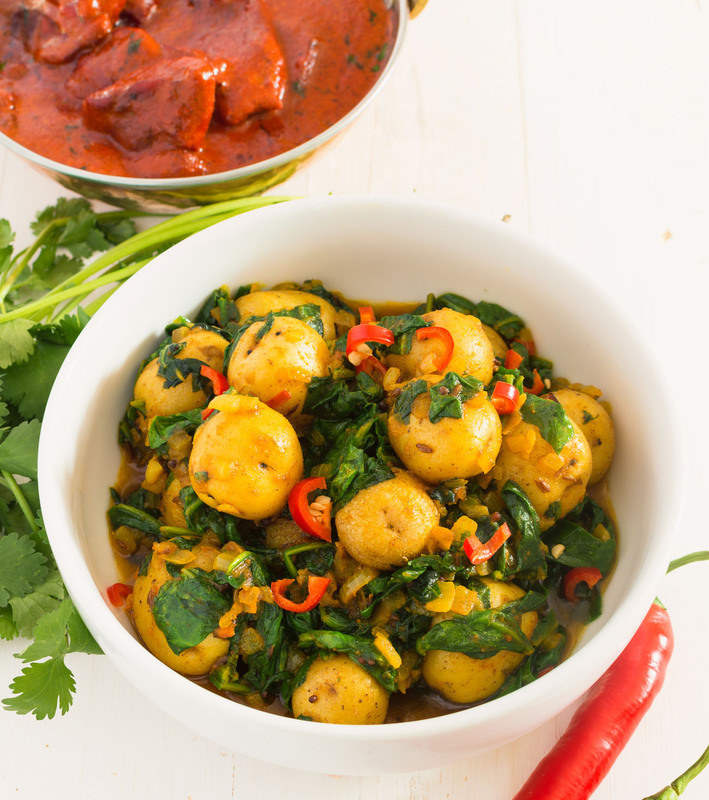 Spinach and potato curry. Simple. Vegan. 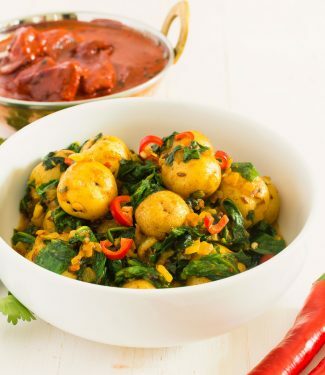 Spinach, potatoes and Indian spices. Delicious. It makes a great vegetable accompaniment to any Indian dinner. I love potatoes. More than rice even. I know. That’s odd. But it’s true. Don’t get me wrong. I like rice. But I love potatoes. So a spinach and potato curry does it for me. This is a simple take on it. Some spice. Some potatoes. Aromatics. And spinach. It comes together fast. It’s easy. But it’s tasty. Don’t be afraid of the whole spices in this dish. They are small. Little flavour bombs. Not like whole cardamom or cloves. You can just eat them. Blooming them in a little oil adds big flavour. Classic Indian technique really. Fry the spices in oil. Now you have spice infused oil. That oil carries the flavour throughout the dish. Delicious everywhere. This recipe uses a bit of Indian restaurant curry base but it’s not critical. If you don’t have any curry base just use water. Or vegetable broth. Nothing to it really. Par-boil some potatoes, fry up some spices and onion, mix it all together and cook briefly. Easy. And you can make it ahead of time. Try this when you are cooking serving up an Indian dinner sometime. It’s a little different. But it’s really tasty. Spinach and potato curry is a flavourful vegetarian curry that goes well with any Indian meal. Pre-cook the potatoes in boiling salted water. Set aside. Heat a saucepan large enough to hold all the ingredients over medium low heat. Add the oil. When it starts to shimmer, add the cumin and mustard seed and cook until they start to barely crackle. Add the oil and onions and cook, stirring occasionally, until the onions are soft. Mix in the garlic ginger paste and cook another minute or so. Stir in the red chili, indian restaurant spice mix (or curry powder), turmeric and salt. Cook, stirring constantly, for about 30 to 45 seconds. Be careful not to burn the spices. Add the water or curry base and cook about 30 seconds. Mix in the chopped spinach and potatoes and cover. Cook until the the spinach is wilted and potatoes are hot. If you don't have curry base substitute water or vegetable stock. If you don't have garlic ginger paste just add 1 1/2 tsp grated ginger and 1 1/2 tsp crushed garlic. In indian, sides and stuff, Vegetarian. Bookmark the permalink.